The 2013 World Series featured two of the game's most storied franchises who were no stranger to the scene in recent years. The Red Sox represented the American League, looking to bounce all the way back from their last-place finish in 2012 with their third title since 2004. St. Louis had other plans, with a young crop of homegrown players who were called upon to help try to bring the franchise its 12th championship. In the end, it was the grizzly, bearded Red Sox who prevailed in six games and celebrated Fenway Park's first World Series clincher since 1918. After a disappointing 2012, the Red Sox tore through the regular season under newly hired manager John Farrell to a first-place finish in the AL East and the best record in the league (97-65). Some fresh faces like Shane Victorino, Mike Napoli and Jonny Gomes were sprinkled in with familiar ones like Jon Lester, Dustin Pedroia and David Ortiz, who went on to be named the World Series MVP. Coincidentally, the only team that could match Boston's regular-season mark was St. Louis, which persevered through a myriad of team injuries to finish atop the National League. They won the contentious NL Central without the services of Chris Carpenter, Rafael Furcal, Mitchell Boggs, Jason Motte and Jaime Garcia. But youngsters like Matt Carpenter, Michael Wacha, Trevor Rosenthal, Shelby Miller, Carlos Martinez and Joe Kelly helped to fill the void. Through everything, Cardinals ace Adam Wainwright remained steady all season and got the ball in Game 1 of the Series against Lester. The powerful Red Sox bats wasted no time thrilling the home crowd, jumping on Wainwright for five runs in the first two innings due to a series of bizarre plays. Typically steady shortstop Pete Kozma made two errors, a popup fell between Wainwright and catcher Yadier Molina and a forceout at second base was correctly overturned, extending a Boston rally. By the time the strange sequence ended, it was too late. The fundamentally sound Cardinals made three errors in a game for just the second time all year and Ortiz and Napoli combined for six RBIs to pace Boston's offense to a 1-0 Series lead. Game 2 showcased the impressive rookie Wacha who, at 22, held a 19-inning scoreless streak heading into the sixth inning after pitching his way past the Pirates and the Dodgers in the postseason. He gave up a two-run homer to Ortiz in that inning, but it was his only blemish on an otherwise stellar night. The Cardinals steady offense scored three runs the following frame and made its way out of Boston with the Series tied. If Game 1 was weird, that wouldn't compare to the strangeness that ensued in Game 3. With teams exchanging blows all night -- the Cardinals took a 4-2 lead with a two-run seventh, before Boston tied it up in the eighth -- St. Louis had men on second and third with one out in the bottom of the ninth in a tie game. 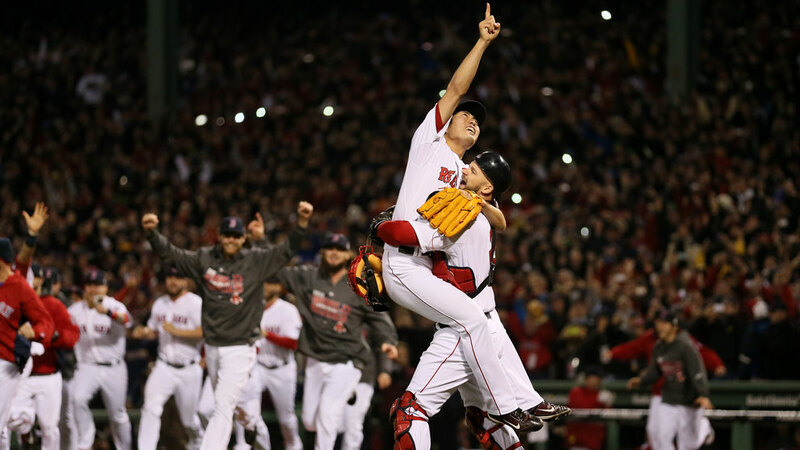 Red Sox closer Koji Uehara, practically unhittable the entire postseason, induced a ground ball from Jon Jay to second with the infield drawn in. Pedroia made a spectacular diving stab and threw home to nail Molina at the plate. With the hobbled Allen Craig trying to advance to third on the play, Boston catcher Jarrod Saltalamacchia threw to Will Middlebrooks at third. The throw was wide and drew Middlebrooks off the bag. As he sprawled for the ball, he impeded Craig's basepath. Third-base umpire Jim Joyce immediately signaled obstruction and home-plate umpire Dana DeMuth then ruled Craig safe as the winning run. After a bit of postgame commotion, it was clear the call was the correct one and the Cardinals had moved ahead in the Series. As it turned out, the Cardinals would not be able to preserve any momentum from their wild Game 3 win. Behind the arms of Clay Buchholz, Lester and John Lackey -- as well as the ALCS MVP Uehara in the relief role -- the Cardinals managed just four runs the rest of the way. Gomes hit a backbreaking three-run homer in Game 4, while Victorino broke things open in the Game 6 clincher in Boston with a bases-clearing three-run double off the Green Monster. A raucous Fenway crowd celebrated for hours long after the game ended as Ortiz was named MVP after posting a .688/.760/1.188/1.948 slash line, with 11 hits in 16 at-bats, seven runs, two doubles, two homers and six RBIs. Lester allowed just one run in 15 1/3 innings, striking out 15.